Keri turned 30! We celebrated by spending the weekend in a beautiful house with a lovely view in Tahoe. We also decided to do a White Elephant gift exchange . I suppose I could have wrapped up some of the old candles that I have in a box under the bed, but I really couldn't pass up an opportunity to make some homemade candy. There are so many recipes that I want to try out of Alice Medrich's Pure Dessert. It is such a beautiful book. It celebrates and highlights the purity of ingredients. It's chapters focus on the flavors of Milk, Grains, Nuts and Seeds, Fruit, Chocolate, Honey and Sugar, Spices, Flowers and Herbs, Wine, Beer and Spirits. As the title suggests, the recipes are all a result of Medrich reexamining old standbys and reinventing them into something simple, pure and unmistakably original. When I first picked up this book to just have a browse, I could not put it down. I have so many cookbooks that I am generally hesitant to purchase more, but Pure Dessert had to come home with me. I will probably post about many of the recipes in the book, like the Heavenly Honey Ice Cream or the Sesame Brittle Ice Cream (ice cream is my absolute favorite dessert). But today is all about the Honey Caramels. I originally wanted to make the Fleur De Sel Caramels, but that recipe calls for Golden Syrup, and I didn't have any. But I did have an old jar of Marshall's Farm Lavender Honey. This jar has to be at least 2 years old. I have a habit of buying special ingredients and saving them for ridiculous amounts of time. I really need to get over that, but I was happy to have such a lovely use for that honey. These caramels were pretty fantastic. I made them on the softer side, and the addition of walnuts added some great texture. I don't think they would be the same without them. Line the bottom and sides of a 9x9 inch baking pan with aluminum foil and grease the foil well, especially the corners. If using the walnuts, spread them in the prepared pan. Set aside. Combine the corn syrup, honey, sugar and salt in a heavy 3 quart saucepan. Cook over medium heat, stirring with a wooden spoon, until the mixture simmers around the edges. Wash the sugar and syrup from the sides of the pan with a wet pastry brush. Cover and cook for 3 minutes. Uncover the pan and wash down the sides once more. Attach a candy thermometer to the saucepan, without letting it touch the bottom of the pan, and cook, uncovered, without stirring until the mixture reaches 305F. Meanwhile, heat the cream in a small saucepan until tiny bubbles form around the edges of the pan. Turn off the heat and cover the pan to keep the cream hot. When the sugar mixture is at 305F, turn off the heat and stir in the butter chunks. Gradually stir in the hot cream; it will bubble up and steam dramatically. Turn the burner back on and adjust it so that the mixture boils energetically but not violently. Stir until smooth. Continue to cook, stirring occasionally, to about 245F. Then cook, stirring constantly, to 248F for soft chewy caramels or 250F for firmer chewy caramels. Remove the pan from the heat and stir in the vanilla. Pour the caramel into the lined pan. Let set for 4 to 5 hours, or overnight, until firm. Lift the pan liner from the pan and invert the sheet of caramel onto a sheet of parchment paper. Peel off the liner and turn the caramel right side up. Cut the caramels with an oiled knife into 1 inch spares, skinny bars or any desired shape. 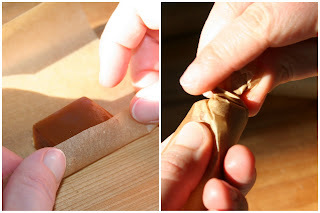 Wrap each caramel individually in wax paper, cellophane or parchment paper. makes about 65 1 inch caramels. I was till a kid last time I made caramels! I know my husband would love these. And it's lovely to have wrapped each caramel individually - make the present truly special. You had me at Medrich and caramels!! Made her recipe a couple of months ago and loved it but I am sure these lavender are perfect. Anything with lavender gets an extra point!